Pima Canyon is one of the Premier Gated Luxury Subdivisions in Tucson. Sited in the Catalina Foothills overlooking the City of Tucson Pima Canyon Estates lies in the upper reaches of the Catalina Foothills with the soaring mountains right behind. This is a truly beautiful area with magnificent views. Pima Canyon Estates has a Manned Gate, one of the few subdivisions in Tucson with that level of gate control. 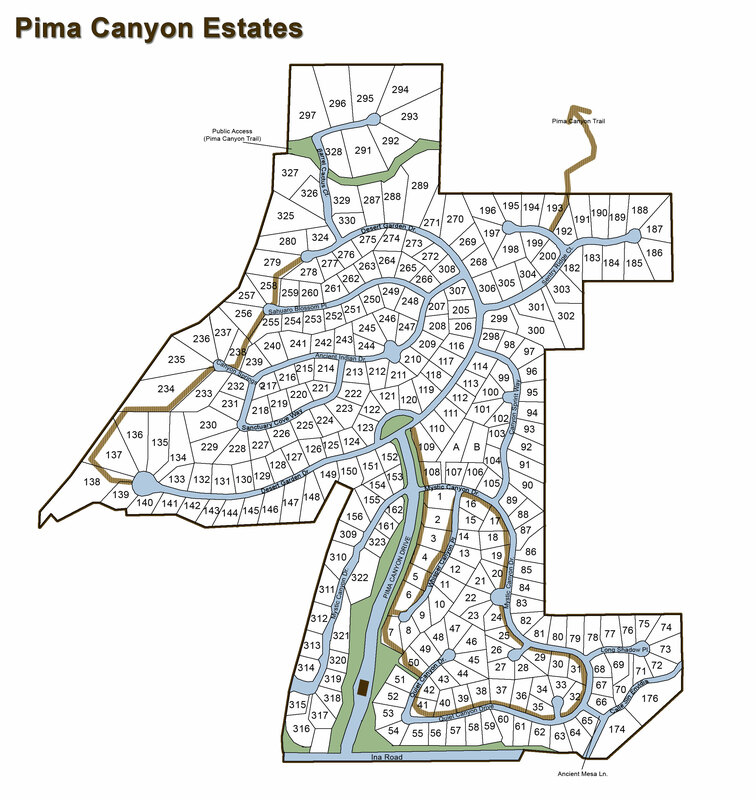 Pima Canyon is also a fairly new subdivision and most of the homes in Pima Canyon were built after 2000. This subdivision has beautiful winding streets with all newer homes, this is not your typical Catalina Foothills mixture of old and new homes mixed together. The Lots in Pima Canyon are all larger starting around an acre and going on up to about 5 acres. The Streets are all paved and there are walking paths throughout the area. Pima Canyon lies on a gently rising slope and thus most of the homes here have excellent views of either the Catalina Mountains or the City Lights of Tucson down below. Conveniently located on the Western edge of the Catalina Foothills Pima Canyon is close to almost everything. Just a couple minutes east to all the Catalina Foothills Shopping & Dining Venues and only a few minutes up into Oro Valley. It is also only a very short drive down into the City proper if you work in town or want to head down for a Broadway Show or an Arizona Wildcats game. Homes for sale in Pima Canyon are some of the finest Luxury Homes in Tucson and range in price from a little over a Million Dollars on up to Several Million. The of the Luxury Homes in Pima Canyon are either Southwest or Contemporary Styles with a few Mediterranean styles mixed in. These are truly beautiful homes in here. Pima Canyon homes are all served by the Amphitheater School District and include the Harelson Elementary, Cross Middle & Canyon Del Oro High Schools.